First, I need to figure out how I am going to keep track of my finishes for my diet. I am such a scatter-brain that I doubt I will remember everything from month to month. I did get Luke finished which made me happy. 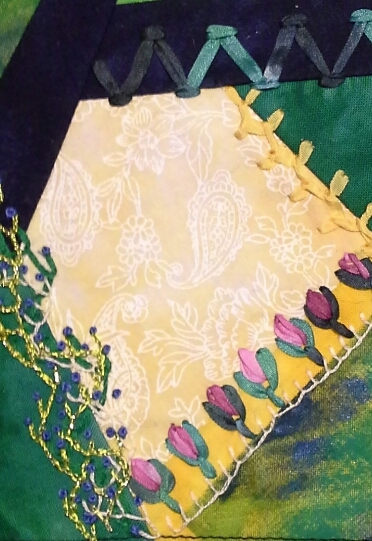 This is a crazy quilt card I made for a friend. The block was started in 2015( I think) and I found the pin at Charming Charley's in the clearance. The back broke off so I had to sew it onto the square. It already had some seam treatments so it was a quick finish. And I did get Star Pumpkin finished, but you saw that already. So I started with $225. -$65 for stash buying. + $1 for stable weight,+ $3 for art pages + $5 for card going out +$12 for the 2 Mill Hill kits. Gay Ann Rogers is having a sale in February too. So many temptations! This is one of my starts from last year. I haven't stitched on it for ages. I pulled it upstairs to take this photo. So how do I intend to make progress on this? I have joined Tammy over at A New Stitchy Start 2017 to see if that will encourage me to work on this piece. I started this last year as one of my crazies. I took some time and got it stitched. I think it will make a lovely card, but that can wait till the fall. I am posting this as my Small SAL 2017 that Stitching Lotus is hosting. I need to make sure I link up on her end. Ever Watch "Ask This Old House"? My boys all loved the section called "What is it?" So that is my question to you: What is it? I think I have the scroll bars/frames that go with the above photo because they all say "Needle-Ease". But these next few photos I have no clue. I received them with some stretcher bars when a friend was down sizing her stash. What are they? Well, I will probably start more projects in 2017, but I am finished for right now. My fingers are itchy to get something done! I have been working on various projects. First up is Drawn Thread Sampler. I am almost to the bottom with the padded work. Soon I will need to do the 4 sided stitches. And the squares that are at the bottom of the piece. I have also worked on Spirit of Jean. It is much easier for me to stitch than the DTS. 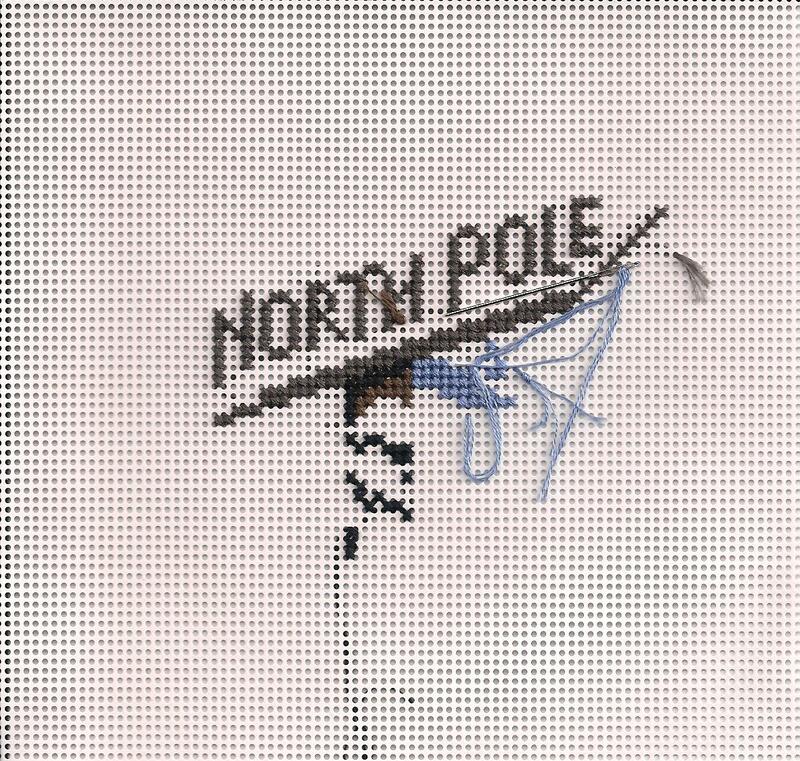 I stitch on North Pole in the evenings right before bed. Not much progress, but at least some stitching is getting done. 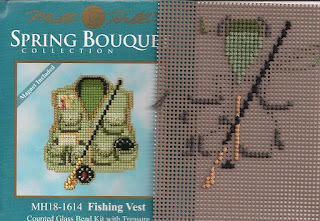 Fishing Vest is coming along. 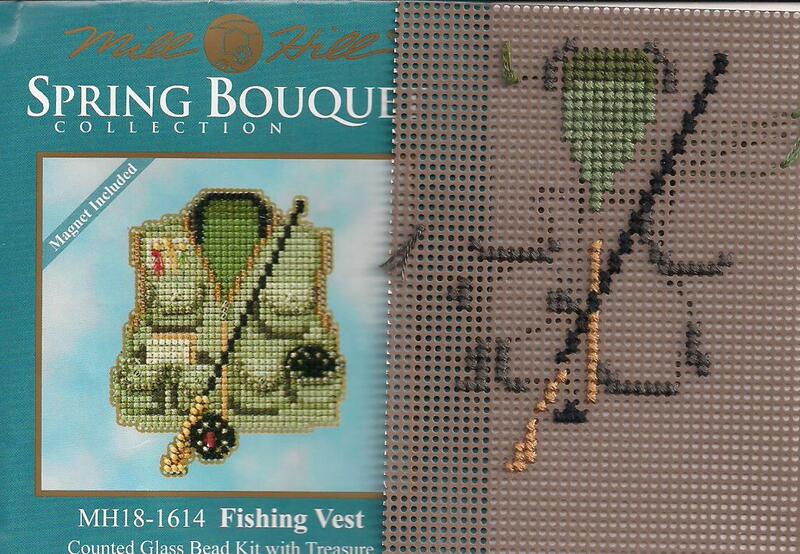 I think I am close to beading. And the last photo is my start on First Christmas Stocking. I need to rip it all out as I am stitching these the wrong direction. I started in the center and I am wondering if I should just start at the top or bottom. Sigh. This piece is my carrot. When I get DTS done,this will get started. Well, I may start it sooner if my friend gets her DTS done soon. This was in Inspirations Magazine I think in Issue 87, but don't quote me on that! It is a fabulous magazine out of Australia and well worth the price of subscribing. 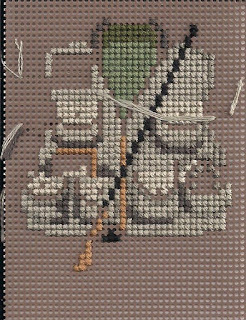 We are losing so many needlework magazines that I would hate to see this one go. My friends and I made these shrink charms and then challenged ourselves to do something with them. The fabric above was from my stash and then I painted it. I have an idea that I need to do and get done before the end of the month. I put this on my list last year, but did not get it done. Hope I can find the threads that finish this off.Could I be lucky and find them in the box marked "Santa"? My dd saw this in a bag I won from my local needlework shop and thought I should stitch it for her. It should be a fast stitch and I think it is a complete kit. My new start is a pilot class for ANG. I can't show you photos or tell you about it. I can tell you I need to finish a project as I am out of tacks and stretcher bars to frame the piece up! Crazy! Here is my progress on my various pieces. No new photo of Spirit of Jean as I did not work on it this week. Sorry for the yellow color on this...It was cloudy when I took this photo of my large Drawn Thread Sampler. A friend handed these to me on Sunday and asked if I could put her grandkids names and birthdays on the back. Her mother made them and I think I can do it. Two of my three children informed me that I need to make myself a stocking this year. 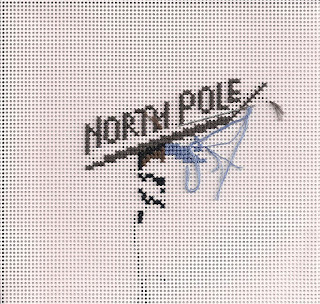 I meant to take a photo of our stockings to show you why, but I forgot...Hopefully I can make real progress on this one so I can hang it this year. Ha! I haven't started stitching, but I did get my fabric ready, found the floss I needed and made notes of what I needed to buy. Question: should I stitch in hand, on a hoop or on scroll frame? I normally do scroll frame but it will be huge and I won't be able to haul it around. This is my "start" for the day and my post for Gifted Gorgeousness. GG 2017 was the brainchild of Jo at Serendipitous Stitching to stitch all those wonderful gifts we have received over the years. My friend Tam gave this to me this year and I did some math-it is 73 x 73 stitches which means if I do 240 stitches a month, I can hang it for Christmas! So lets see if I have some progress by February. I need to get some things finished and out of the house. With a little more stitching, this will be able to go out. This piece was dyed by a friend and I feel the need to finish stitching it. I think I need to add yellow along with the pink. I am not sure which heart I will stitch, but I know I will pull one this year and work on it. Here are pictures of two finished hearts that I hope to hang before February 14. When I pull my next one, I will share it here. This is my start for day 11. A friend commented that it really doesn't count if I haven't taken a stitch on the piece.....Oh well. I need this on my list so it can be done in 2017. I saw this online and thought it would be great as a gift for my dad. Only problem is that his birthday is in February. Yikes! I think I bought these before I got the Nativity series. The date on the package is 6-9-11. I haven't started this yet, but it I need to get it done for my holiday decorations. Yet another one from 2016. I hope to get this done this year. 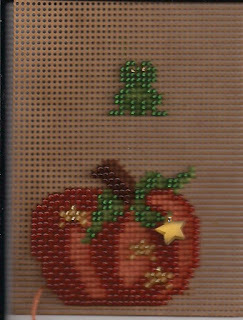 I really love this piece and would work on it every time I stitch, but it is not a priority to get done immediately. (Please excuse my green thumb. I have been playing in my paint.) I have been working on this most evenings and trying to get 100 stitches in a day. I don't always succeed, but I am making progress. I think this will be my first finish of 2017. This one is the major piece from Gay Ann Rogers . It was offered as one of her E-Week sales in 2014 or at least that was when they formed the yahoo group for the piece. Thank goodness I have a friend who is holding my hand on this piece. I took these two resolution lists from Gay Ann Rogers blog and I think they are very true. What do you all think? I do several of these things. Keep a blog, mix up techniques, work 15 minutes at a time. But I think I gleaned a lot of these from Gay Ann over the years.Hope you enjoy these lists too. Pay particular attention to #1, #9 and #10. 1. Slow down and savor each stitch. Remember that slowing down is probably the best suggestion for improving the quality of my work. 2. Remember Time Management: work steadily and far enough ahead of a deadline so that I am not in a last-minute crunch (this is probably the second best suggestion for improving my stitching). 3. Use a doodle canvas to practice a technique before I start doing it 'for real'. 4. Use a doodle canvas to warm up, even if it is for only 2 or 3 stitches. 5. Try to stitch for 15 minutes each day, with a bonus session of an hour a week. We have much in common with musicians: repetition helps us improve; if we don't practice our craft we get rusty. 6. Don't work too long at a single time. I notice if I start to tire, the quality of my work goes down hill. If I have a whole day to stitch (wonderful!) remind myself to take breaks every half hour or 45 minutes. Do a couple of hand exercises, give my eyes a rest by looking off into the distance. 7. Work ONLY in colors I love. Never work in colors I don't love. I don't use the word 'never' very often, but this is one time I do and I mean it. If I don't love the colors, my work doesn't stand a chance of being the best I can do. 8. Mix up techniques: if I just finished a boring area, do something fun; if I just finished a difficult area, kick back and do an easy area. 9. Before I choose a thread, ask myself: am I choosing this thread on whim or am I choosing it because it harmonizes with the design? 10. Before I add more texture to an already busy design, ask myself, does this stitch add to the harmony of the design or is it just adding to clutter and goop. Ten New Year's Resolutions to Motivate Stitchers Toward the Finish Line. 1. Look through my stash, find a project I started and still love. Set it up and make it a priority for 2017. 2. Now ask myself: why did I stop work on the project? Got stuck on a stitch? Rip the stitch and change it to one I'm more comfortable with. Don't like a color? Change the color. Do what it takes to make the process easier on myself so that the excitement I felt when I first started the project returns. 3. Have a question? Ask a friend. Ask online. Somebody who is working on the project or who has completed it will likely have a suggestion. 4. 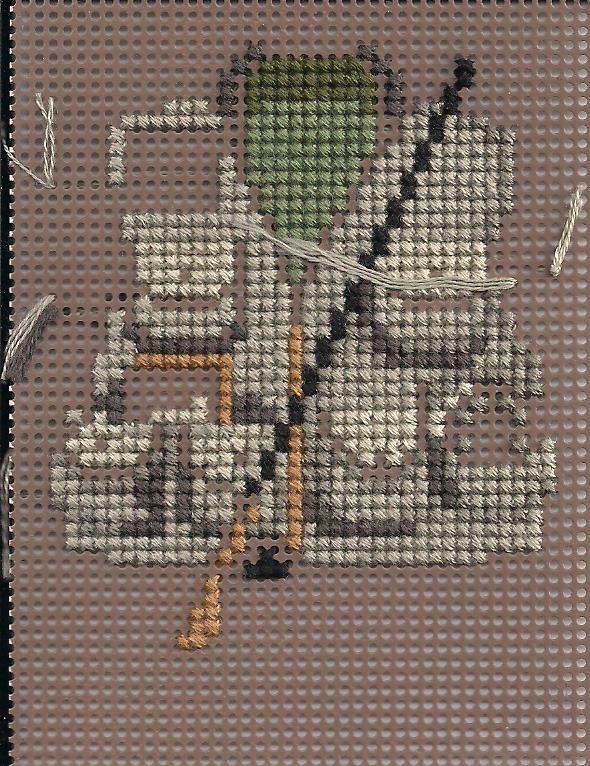 Leave the project set up so that I can take advantage of stolen minutes to stitch. Waiting for DH? Don't pace or twiddle my thumbs wondering why he is late; pick up my needle until he is ready to go. 5. Each time I complete a session, thread my needle for the next session. 6. Set a reasonable goal for stitching each day. Try to stitch 15 minutes a day. If I can't do it all in one session, divide it into five minute segments. 7. Keep a log of the amount of time I stitch. Make a couple of columns, one for meeting time goals (On January 1, 15 minutes), one for stolen minutes (On Jan 2, 4 minutes). 8. Use my phone to keep a log of my stitching progress; just snap a quick photo once a week. Each month look back and see how I've done. 9. Mix up techniques: if I just finished a boring area, do something fun; if I just finished a difficult area, kick back and do an easy area. 10. Try to set aside bonus time of an hour. once a week. Justify it this way: it is time for me to chill, kick back, relax, de-stress, enjoy myself, put the woes of the world out of my mind, and lose myself in beautiful colors and textures and something I love to do. I not only deserve the time, I need it. Oh! I didn't do my Stash Diet update on the 1st so it will be at the end of month. Makes sense at least for January! Unlike some of the ladies who do this, I will only be "working on" 31 pieces this year. Some will be new starts, but most will be WIPs or part of my stash that I need to do. Yep. My first is Doodle Drawn Thread Sampler. It is supposed to be stitched by February 14,2017 but I doubt that will happen. I think I will be making a $10 donation to my local EGA. So what are you stitching in the new year?